We need more radical centrists like Raimondo. “It takes a lot of spine to be a centrist in America today. You get whacked from the left and whacked from the right. That’s my life. I get whacked.” Sounds familiar. 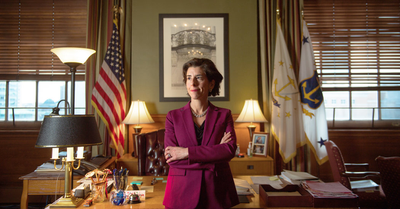 I like Gina Raimondo, but Rhode Island's politics are so odd I think it's impossible to draw national lessons from there. In particular, while she is a moderate, the RI Dem party has lots of prominent pols to her *right*, including the state house speaker.
.@FrankBruni found an accomplished, qualified Democratic officeholder who actually hasn't flirted with a 2020 presidential run. And she's worth listening to. “So many Democrats just assume we’re going to win,” she said. “They underestimate how hard it’s going to be.” Would be good if more Dems were like Gina Raimondo. This @FrankBruni column is absolutely astonishing. The whole thing is about how Raimondo is a "moderate," but I challenge you, reader, to tell me, after reading, what "moderate" means. She ... says nice things about business? is that really it?